Without a doubt, the big ticket item for starting school or kinder is the backpack. Nothing says “big kid” like their own bag, and if you are fortunate enough to get a say in the matter (and the school doesn’t force you into a uniform-matching monstrosity), you are spoiled for choice. With so many great backpacks on the market, here are a few noteworthy mentions! The Fluf Organic Cotton backpack (pictured above in two of three available designs) is completely machine washable, so there’s no more worrying about what that might have been growing in the bottom of last year’s bag. They’re certified organic and are a bit smaller than the average bag, which is great for preschoolers. We think they’re pretty cute to boot. Get yours from Kindred Gifts for $39.95. Looking for something a bit bigger and brighter? The Little Beetle backpack might be just the thing for your little beetle. 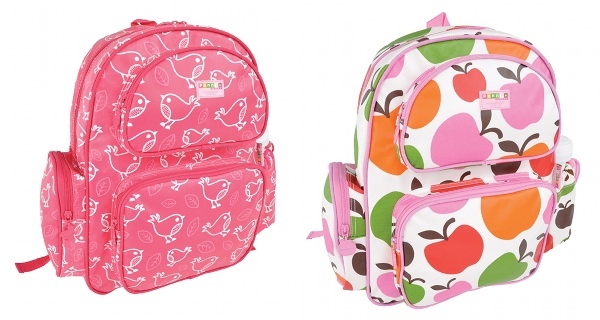 It’s roomy, with a padded back and straps plus a large compartment that’s easy for little hands to navigate. And – always a winner – it comes with its own drink bottle. Find these and more designs at Haggus and Stookles for a cool $39.95. Beatrix New York backpacks are finally available in Australia! No more gazing wistfully at shots of celebrities and their kids toting these stylish little wonders, you can now just pick one up for yourself (I mean, your child!). Sukimama is stocking four designs at $45.95 each. 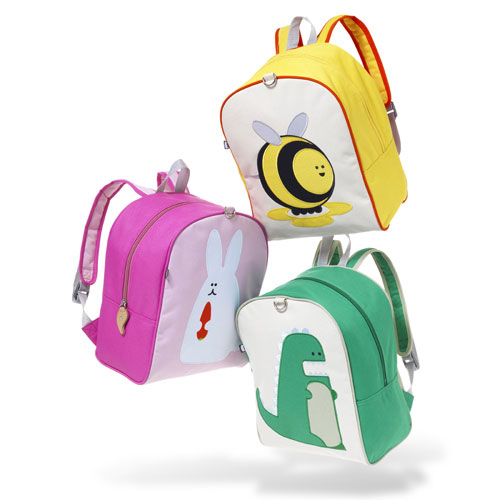 Made from sturdy, laminated canvas, they are big enough for the essentials (with a smaller zippered compartment inside) but not too big to overwhelm the shoulders of smaller children. Every child I’ve ever met loves a bag with their name on it. 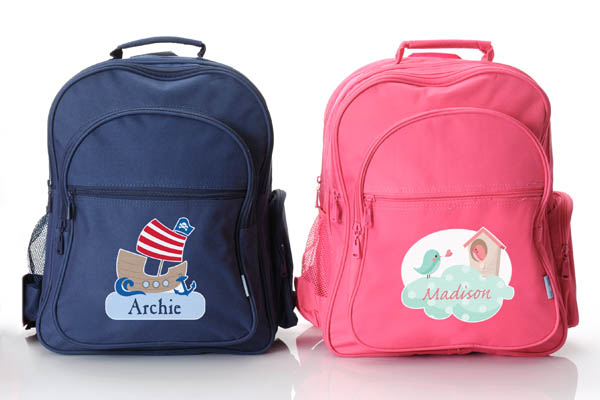 Personalise your own with these hard-wearing and fully lined backpacks from Stuck on You. Available in navy, pink or red, in a huge range of designs, they are currently on sale for $44.95 at Stuck on You. 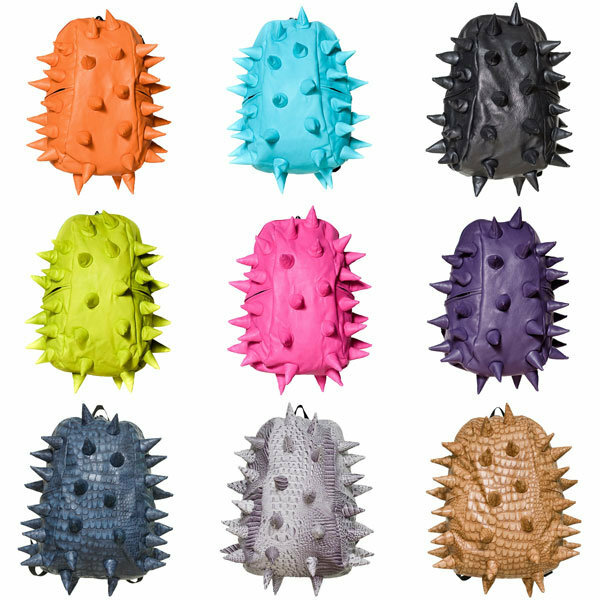 These backpacks from Penny Scallan seem to be everywhere at the moment, and for good reason. Totally wipeable, they come in six fun (but not cutesy) designs and are big enough to carry everything needed for a full day out. These ones are great for slightly bigger kids and might be a bit too large for a preschooler. I’m just waiting for my daughter to get old enough to buy the Apple design, which is definitely my favourite. Have a look at Penny Scallan for these and the boys’ designs, which all go for $49.95. Of course, it’s not all backpacks at school and preschool these days. 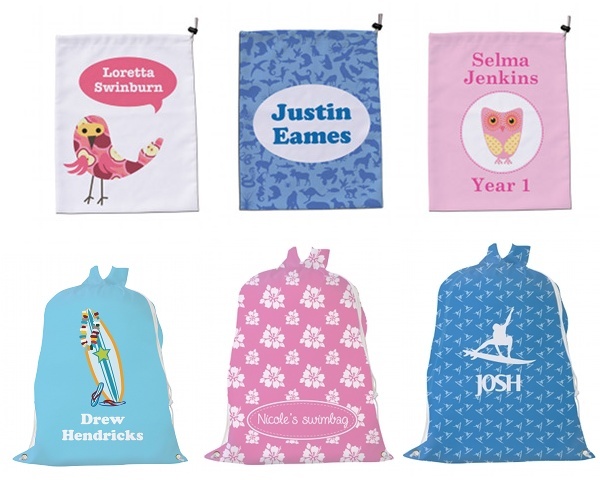 If you find yourself needing a library bag (and you will) or a bag for swimming gear, we have you covered with bags you can personalise from Bosco Bear. The library bags are $29.95, swim bags are $44.95 and both can be jazzed up with names and designs of your choosing. They’re Australian designed and made and the swim bags are brand new on the market this month. If the backpack wearer in your life is a bit hard on their bags (you all know the child I’m talking about) – something made from durable PVC might be a better option for you. 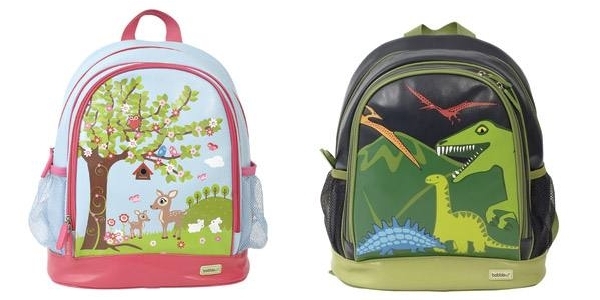 Lime Tree Kids stocks the adorable Bobble Art large PVC backpacks in a range of designs which are great for both girls and boys, and you can pick one up for $39.95. Although they don’t have any Australian stockists at the moment, we couldn’t resist mentioning these ultra cool Spiketus Rex backpacks from Mad Pax. Anklebiters can really stand out from the crowd with these, which come in two backpack sizes and two smaller, tote bag sizes (the Nibbler, and the Mighty Bite!). 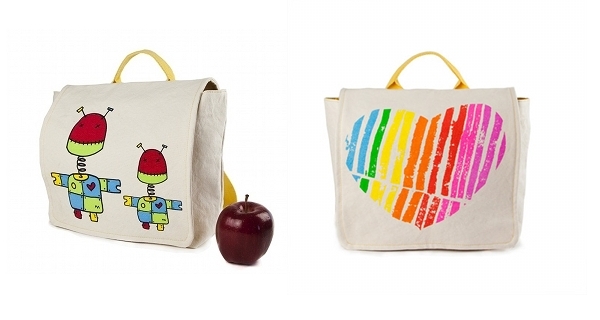 The Full Pack is US$60 and the Half Pack (for preschoolers) is US$46. There’s no direct option for mailing to Australia in their online shop, but if you email them they are happy to ship internationally and will send you a quote.